To celebrate the 20th anniversary of the Bespoke Cigars a sub brand Villa Casdagli Collection will be launched focusing on the production of luxury cigar smoking accessories. The first item of the Villa Casdagli Collection is a truly unique line of humidors which will be created in collaboration with Master Cabinet Maker Nils Langhoff. Commissioned by the Casdagli family in the early 1900s the Dubara Palace, also known as Villa Casdagli, became legendary for its parties epitomising the golden age of cigar smoking. „From the very beginning of the creation of the Bespoke Cigar brand I wanted to draw inspiration from my rich family history as well as to ensure craftsmanship of the highest quality for all of our products. With Nils I feel we are in the best hands to continue with this tradition,“ Jeremy Casdagli, the founder of Bespoke Cigars says. „This is such an exciting project and I am looking forward to its development over the oncoming years,” Jeremy adds. With the external veneer being protected with up to 7 coats of laquer and the interior lined with the best spanish cedar Bespoke Cigars’ humidors are truly the epitome of luxury. 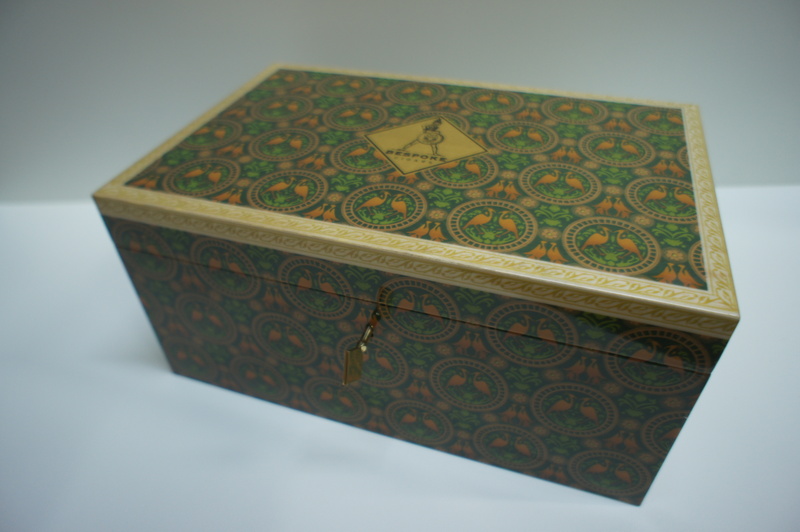 The vibrant design and colours adorning these humidors are directly drawn from the original wallpaper decorating the byzantium style reception room of the Dubara Palace in Cairo. “It was at chance meeting with Jeremy Casdagli during a cigar party in December 2017 that the Bespoke Humidor Collection was born. As an avid cigar smoker I was naturally drawn to the idea of creating a luxurious but sophisticated humidor line for Bespoke Cigars. The intricate design was a particular challenge and took a long time to get right. But the result I believe is exactly what we both envisioned,“ says Nils Langhoff. Following his apprenticeship in Hamburg Nils Langhoff qualified as a Master Craftsman in 2000 and is currently based in Munich. Mastering traditional techniques he became reknowned in his field for the preservation of monuments, restorations, surface finishes, shellac polishes and interior design. He founded his own company “Haptikum” in 2013.